The following is a post from a reader who wishes to remain anonymous. It’s an incredible debt story I helped them with so I asked if I could share it. I have added some notes in Italics and links that might help. Last year things looked dire for us – $90,000 in debt with debt collectors knocking on our door, losing our home and both of us unemployed. With 2 children, our lives could not continue like this. It looked like the end for our relationship, we were depressed, broke and I didn’t think we would be able to get through it. One night we sat down and went over all our expenses, how much debt we were in and instead of feeling empowered and in control, I felt nothing but despair. How on earth could we crawl out of the hole we had found ourselves in? We accumulated debt from medical bills, legal bills, consumer debt (a car loan and his credit cards where he spent on anything and everything). We were renting and could no longer afford to live where we were. Now, almost a year later, we are debt free, have savings, are healthier (having lost 30kgs between us) and are much happier. It didn’t happen quickly, it certainly wasn’t easy, but we did it. 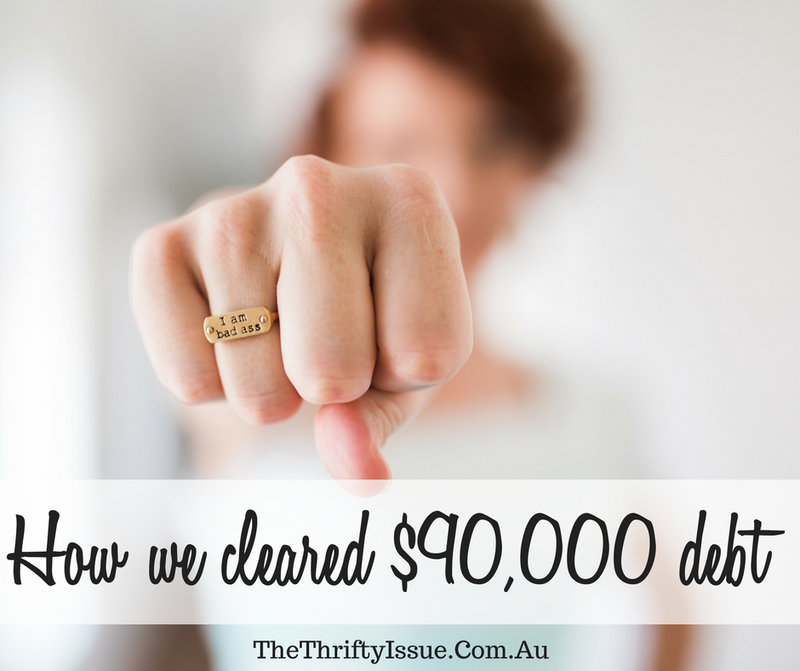 How did we pay off $90,000 debt? We didn’t know where to start and wanted help in working out our budget, ways we could make extra money and cut back, specific step by step advice to apply to our lives. We weren’t looking for a financial advisor to show us where to invest or anything. We needed financial mentoring or counselling. There are free services through charities but I wanted immediate help and a friend referred us to Kylie Travers. I reached out to her, did the questionnaire she sent and we had our first Skype session to go over our finances, work out our budget and get the advice we needed. We had numerous debts and some had debt collectors chasing us. Kylie’s dad was actually a debt collector years ago, so had some great advice here. She said people mainly want to know they will get paid and as long as you are open, honest and speak with them politely, make some payments etc it will work out. We spoke with them all, made arrangements and applied for financial hardship to get a break from some payments with our bank which would not go on our credit file as long as we kept them in the loop with everything. This is a band-aid fix though and meant the interest continued to accrue at a crippling rate. We had no other option at this point though. With all the debt collectors, I spoke to them at a time that suited me and when I had all my paperwork in order. I made a small payment on the call then agreed to a payment plan with each. I went through all our belongings and if it wasn’t essential, we sold it. At first, it was hard, then as the money came in and I was able to clear some debt, it got easier. Plus, the less we owned, the less I wanted to own. (Check out how to make $10,000 a month reselling stuff). I listed items on eBay, Gumtree, Facebook, emailed friends and family, put flyers up on community noticeboards and let everyone know I needed to clear as much as possible. Those close to me knew our financial situation so actively tried to help me sell as much as I could, plus provided a few ways to make some more money such as babysitting and house cleaning, which I will get to in a minute. We didn’t sell it for quite enough to clear the total car loan, but $15,000 was better than nothing at that point as it cleared 1/6th of our total debt. The loan payments, insurance, maintenance, roadside assistance and other car related expenses were more than we could afford. We now use public transport, walk or on two occasions have hired a car for $150 each time, much less than the cost of owning our car. (Check out Car Next Door and get $15 off here if you need to rent a car. Also, how to live without a car). I got online and searched for all the ways I could make money from home. Being school holidays and the Christmas break, I couldn’t afford childcare, so it had to be work from home options. I applied for freelance writing work and landed a few gigs at $150 here, $50 there. I also did online surveys with Swagbucks. Find a full list of online survey sites for Aussies here. I took on cleaning, ironing and babysitting. I checked AirTasker and GumTree as well as telling friends and family I would do any work I could. My income was sporadic and while I started to apply for jobs as well, thinking I would just make it work, I didn’t have any call backs for an interview. This saved us. While everything else we did was good, we were only just scraping by. He got a job and asked for the top of the pay scale they were offering. He got it and we were ecstatic until the debt collectors found out. Within one month of starting the new job, we suddenly had everyone demanding to be repaid at unrealistic rates. All income coming in was expected to be allocated to debt and we were terrified. We were given 1 month to clear some of the debts. This is another reason we sold the car when we did. To clear one of the debts putting significant pressure on us. I didn’t work every week, but casual work started coming in. Online work was often paid in advance which meant I was able to have the money sit in my loans and redraw later. Work doing cleaning and other odd jobs picked up once the kids were back at school too. We did this from the moment we spoke with Kylie and realised how bad our situation was. No take away, no coffees, no movies, no entertainment, nothing that wasn’t completely 100% essential for our survival was paid for. With the car gone, we got rid of insurance. I went over every area of our budget with a fine tooth comb and cut back. (Check out 31 ways to save over $200 for some ideas). Every cent we got went to debt. If we saved $1 on groceries, that $1 was transferred to debt. As soon as we sold something, money went straight to debt. We did not want to be tempted and knew if we weren’t strict we couldn’t do it. It took one year to clear this debt. As soon as one debt was cleared, all the money we had been paying on it went to the next debt and so on until all debt was cleared. The relief we felt as each debt disappeared was incredible. Most of the money we paid off came from selling off what we owned and taking on extra income opportunities, not from our jobs. I look back now on the stuff we spent money on and cannot believe how much we wasted. Not only did we spend on things we did not need, we paid interest on it then spent a year paying it all back, stressed out of our minds when we could have been enjoying life if we’d been on top of our finances. I will never go into debt again, except for a mortgage. Even then, the debt will be minimal. Have you paid off a large amount of debt? Interesting story, I’ve never been in that situation but it’s good to know that there is a way out if it ever happens. Well done for overcoming adversity!